THE VALUE OF LIFE, LEGS, AND PRAYER. Entering a remote train station was risky; being arrested was constantly on my mind. Each time I left the security of The Wall to search for drinking water and food meant I was exposing my location. Resting for more than a few minutes would be a dangerous luxury. I was on-the-run because… in the eyes of the Chinese Government…I was a fugitive. I had followed railroad tracks to this location. Trains are the most popular way to travel in China and their train stations are well-maintained. There, I could expect a stove with boiling water, a place to rest, and perhaps a less-obnoxious outdoor toilet. I was so very tired. My mileage meter showed I had completed 33 miles since 6 AM. Judging from the sun...and my watch...it was 2:30 PM. I had been on-the-move for more than eight hours. Pulling the camera from the safety of my backpack, it attracted the usual attention. Each day I took as many photos as possible to document this first-ever journey. It’s unlikely I’ll pass this way again. I was impressed with the spaciousness of the station and needed to take pictures quickly as more and more Chinese crowded through the door. The curious were both young and old and most were dressed in shabby, patched garments. They grouped around me to boldly stare, as I aimed my camera at the large-framed paintings on the back wall. “I will help you Missy Lady. I not speak it much but I write English”. The crowds parted as a young man with only one leg, leaning on a crutch-like stick, hobbled toward me. In what I describe as “hop-scotch” English, the young Chinese, looking about twenty or twenty-one, introduced himself as Zhao Li Gong and apologized for his limited vocabulary. I assured him that, at the moment,He was my hero and his English words were like mania from heaven. Grasping a small rock in his right hand (I later learned that Chinese are not allowed to be left-handed) he transformed one of the station’s plaster wall into a blackboard, scratching-out beautiful English as he answered my many questions. Touched by the story, I yearned to hug this tall, baby-faced man who, at the age of eight, had lost his leg in a bicycle accident. Because public hugging or touching is forbidden in Chinese Culture, (even between husbands and wives), I knew such a gesture would be shockingly inappropriate. So I stood, quiet and still, knowing I was in the presence of a remarkable human being. Remembering that most Chinese enjoy posing for photos, I gathered everyone around for a picture, including train station personnel and my friend Li Gong. Craftily, I positioned everyone under the station’s large paintings. An enthusiastic onlooker was thrilled to hold my camera as I gave him a quick lesson in focus and how- when to click. The station manager, eager to stand beside me for the photos, seemed to forget about the station’s valuable paintings in the background. As my new friends gathered on either side, waiting for the flash, I smiled through happy tears. Soon,after refueling my water bottles and resting for a short while, it was time to go. The cold wind and threat of rain meant I must hurry; the tent had to be up before dark. Li Gong insisted on leading me to the next section of the Wall, which was more than two miles away. My cautious words could not discourage my amazing one-legged friend so, together, we began moving in a northeasterly direction toward the Wall. There was very-little light when we reached our destination. Saying our final good-byes, my courageous friend handed me a small piece of paper with his name and address written in Chinese. Tucking the note into my vest pocket, I promised to send him a letter. Then, on instinct, I hugged my new friend. I wanted to reassure this overlooked talent that someday soon, goodness would find him. Beginning my long climb, I glanced back---one last time. Smiling bravely, Li Gong waved as he began limping home in the darkness. Postscript: In 1994, I accept the Chinese Government’s invitation to serve as the first Communication Specialist at China’s only Broadcasting Institute. With great enthusiasm, I returned to China. One afternoon, walking down Beijing’s crowded Chong an Street, I spotted a young man with only one leg, walking toward me. Memories from the past… from a remote train station with ancient paintings… remembrances of a young, one-legged Chinese man who wrote English on the station’s wall….merged together. I noticed the man’s crutch-like stick...could it be? Now face to face, we looked at each other….and stopped. Yes, it was my friend. At the very same time, we reached out to grasp hands with each other. Regaining his composure, Li Gong told me about his new teaching job near Beijing. There, on the streets of Beijing, surrounded by curious strangers, I hugged my friend once again, my most unforgettable friend. It was wonderful to learn the Ministry of Education had reconsidered Li Gong's request to attend college, realize his dream and--at long-last-- Li Gong was now a teacher. 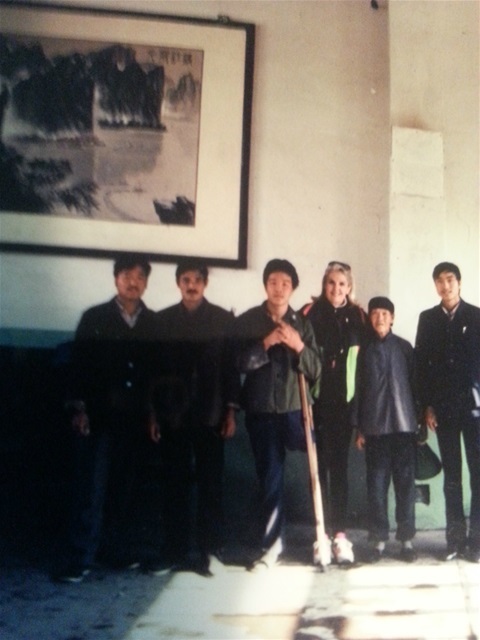 Let me back-track for a moment: After completing my Great Wall Journey , near the end of 1990, I'd insisted on meeting with China’s Ministry of Education. I told him my story about meeting Li Gong and urged the Education Director to let the brilliant young man fulfill his dream of becoming a teacher. The Director listened, obviously interested, but remained noncommittal. Before leaving his office, I stressed, again, the importance of my request, thanked him for our meeting, then left. Shortly after the meeting, I returned to America...but I never stopped praying the Director would have a change of heart. Today, I knew for sure that my prayers were answered. Again, I’d connected with someone from my past, someone I’d met on my journey of China's Great Wall. Was it simply a chance meeting or was it another important part of a much-greater plan? By now you know….. I don’t believe in coincidences.